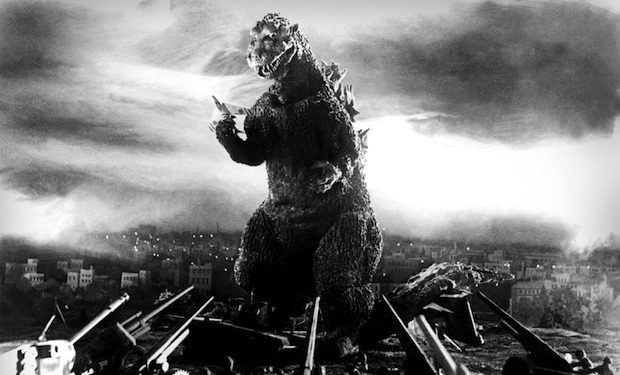 You read that right: This week of movie watching is dedicated to everybody’s favourite, reptilian destroyer of Japanese cities, Godzilla (a.k.a. Gojira). Why Godzilla? Well, it started after watching Dragonslayer – I was talking to my buddy and thought that perhaps a week dedicated to movies about Dragons might be a cool idea… Until I started searching out movies about Dragons – there aren’t many, and for the most part, the ones that do exist I am not interested in. Except one thing: I consider Godzilla to be a Dragon, and there are a lot of Godzilla movies to choose from, and I just happen to like Godzilla. I think this is what is known as a Win/Win situation folks. Over the next week I will write up the Godzilla movies I watch and share them with you, as usual. But take note: I will not be watching the travesty of a Godzilla movie that starred Mathew Broderick – to me that is not a true Godzilla movie. So… Welcome to Godzilla Week my Internet friends! This entry was posted on March 4, 2014 by catfishman. It was filed under 1950s, 1960's, 1970's, 1980's, 1990's, 60's, 70's, 80's, 8mm, Airport, Alien, Awesome, b movies, bargain, blogging, brains, cheezy, civilization, Classic, cops, crazy, death, dinosaur, dragon, drive in, effects, entertaining, entertainment, epic, fantasy, film, fun, funny, great, gritty, horror, humanity, Japan, japanese, Mob, monster, movies, original, revenge, reviews, sacrifice, Sci-fi, science, Science Fiction, self preservation, series, silly, Society, special effects, Sushi, Toys, trailers, watch, Western and was tagged with 1950s, 1960s, 1970s, 1980s, 1990's, 60's, 70's, 80s, 8mm, Airport, alien, awesome, B Movies, bargain, blogging, brains, cheezy, civilization, classic, cops, crazy, death, dinosaur, dragon, drive in, effects, entertaining, entertainment, epic, fantasy, film, fun, funny, Godzilla, great, gritty, horror, humanity, Japan, japanese, mob, monster, movies, original, revenge, reviews, sacrifice, sci-fi, science, science fiction, self preservation, series, silly, Society, special effects, Sushi, Toys, trailers, watch, western.